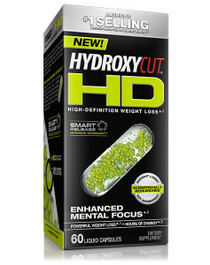 Answer: Hydroxycut is safe to use by healthy adults when used as directed on the label. Please read the entire label before use. To assess individual tolerance, for the first 3 days, start with one (1) caplet taken with a glass of water two (2) times daily, approximately 30 to 60 minutes before your 2 main meals. For days 4 and beyond, take two (2) caplets with a glass of water two (2) times daily. Do not exceed two (2) capsules in a 4-hour period and/or four (4) capsules in a 24-hour period. 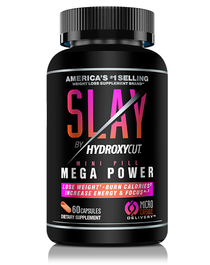 Take 1 serving (3 capsules) twice daily, 30 to 60 minutes before your 2 largest meals. Do not exceed 6 capsules in a 24-hour period. For best results, use for a minimum of 60 days in combination with diet and exercise. Always read the entire label before use and follow the directions provided. Take 1 serving (3 gummies) twice daily, 30 to 60 minutes before your 2 largest meals. Do not exceed 2 servings (6 gummies) in a 24-hour period. For best results, use for a minimum of 60 days in conjunction with a calorie-reduced diet and regular exercise program. Take 2 capsules with a glass of water two (2) times daily, approximately 30 to 60 minutes before your 2 main meals. Do not exceed two (2) capsules in a 4-hour period and/or four (4) capsules in a 24-hour period. Open a standard 16.9 oz. bottle of water, take a sip, then empty 1 packet into the bottle, shake and consume immediately. Take each serving 30 to 60 minutes before your 2 main meals. Do not exceed 2 servings (2 packets) in a 24-hour period. Consume 8 to 10 glasses of water per day. Read the entire label before use and follow directions. Take 1 serving (2 caplets) twice daily, 30 to 60 minutes before meals. Do not exceed 2 servings (4 caplets) in a 24-hour period. For best results, use for a minimum of 60 days in conjunction with a calorie-reduced diet and regular exercise program. Consume 8 to 10 glasses of water per day. Read the entire label before use and follow directions. Shake well before use. Squirt 1 serving (approx. 2/3 tsp.) in water and drink two times daily, 30 to 60 minutes before your two largest meals. For the additional benefit of an energy increase, squirt 2 servings (approx. 1 1/3 tsp.) in water. Do not snack between meals or before bed. Do not exceed 2 servings (2 squirts) in a 4-hour period or 4 servings (4 squirts) in a 24-hour period. Read the entire label before use and follow directions provided. To assess individual tolerance, for the first two days, start with one (1) capsule, taken with a glass of water two (2) times daily, approximately 30 minutes before breakfast and lunch. For days three and beyond, take two (2) capsules twice daily, approximately 30 minutes before breakfast and lunch. 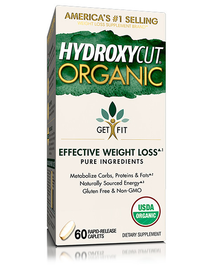 Take 1 serving (3 capsules) twice daily, 30 to 60 minutes before your 2 largest meals. Do not exceed 6 capsules in a 24-hour period. For best results, use for a minimum of 60 days in combination with diet and exercise. Drink 8 to 10 glasses of water daily for general good health. Always read the entire label before use and follow the directions provided. Take 1 serving (2 capsules) twice daily, 30 to 60 minutes before your 2 largest meals (e.g., breakfast and lunch). Do not snack between meals or before dinner. Do not take within 5 hours of bedtime. 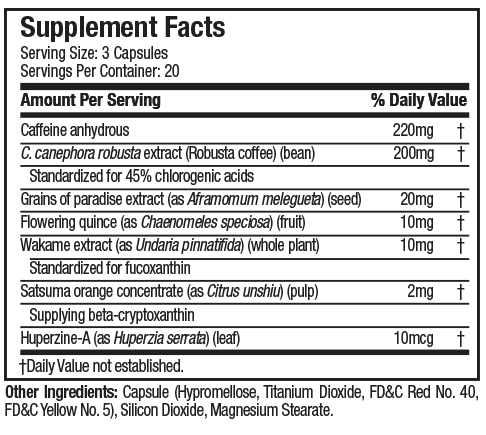 Do not exceed 2 capsules in a 4-hour period and/or 4 capsules in a 24-hour period. For best results, use for 60 days in combination with diet and exercise. Always read the entire label before use, and follow the directions provided. Take 2 capsules twice daily, 30 to 60 minutes before your 2 largest meals (e.g., breakfast and lunch). Do not exceed 4 capsules in a 24-hour period. For best results, use for 60 days in combination with diet and training. Always read the entire label before use and follow the directions provided. Take 1 serving (2 capsules) twice daily, 30 to 60 minutes before your 2 largest meals (e.g., breakfast and lunch). Do not snack between meals or before dinner. Do not take within 5 hours of bedtime. Do not exceed 4 capsules in a 24-hour period. For best results, use for 60 days in combination with diet and exercise. Always read the entire label before use and follow the directions provided.